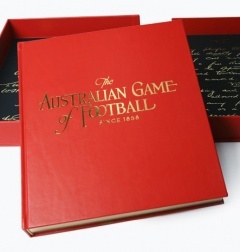 The 150 limited edition copies of the Australian Game of Football each commemorate a year since the birth of the world's first codified game of football. This definitive resource of all that it means to play, support and nurture the game is accompanied by a numbered certificate of authenticity signed by Andrew Demetriou, Chief Executive Officer of the AFL and Mike Fitzpatrick, Chairman of the AFL Commission. Each stunning edition is gold-gilded, bound in official red Sherrin leather, numbered by a gold foil stamp on the back and comes beautifully encased in a leather-bound case with foiling. 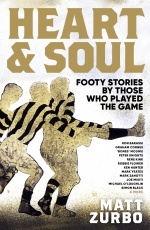 As part of the Australian Football 150 Years celebrations in 2008, The Slattery Media Group published The Australian Game of Football, on behalf of the AFL. The Beginning – historical analysis and commentary on the game's early days including its growth and spread. 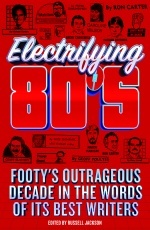 The Game – including Mike Sheahan's top 50 players of all time, the top 10 players to have played in WA, SA and Tasmanian State Leagues, tactics, coaches, umpires, trends and Adam Goodes' essay on the indigenous contribution to the game. 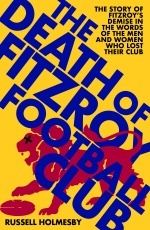 The Passion – including an essay on the game belonging ultimately to the fans, football in the community, local clubs and the role of women. The Business – commentary on the impact of the media, influential figures and strategy. The Decades – including a snapshot of the game, decade by decade over 150 years, including ladder positions for all years for the VFA, WAFA and SANFL. Please note that standard shipping costs apply on this item. James Weston has covered Australian Football for more than 20 years, and is a former sports writer for the Herald Sun and The Sunday Age. He has managed a number of large publishing projects for News Limited, including the Rugby World Cup 2003 publishing licence, and official programs for the Australian Open Tennis, the Grand Prix Corporation and Cricket Australia. He now runs his own media and communications company.